Hi all. Introducing Monsterwagon 2.0 as she currently sits. I will write up a massive build thread at some point soon - I have a heap of photos from along the way. But basically, I wrecked the previous Monsterwagon as the body was stuffed. Purchased another wagon of the exact same model (white MPFI touring wagon) in Feb 2014. This one already came with a bodgy 2" lift, 14" muddies, EJ22 with adaptor plate setup to 5speed. Generally the mechanicals were in terrible condition, and the body was "okay" but had particularly bad rust in one area. Over the last 2-years I've made a few changes. I'll include a heap of details. Here is a brief summary. At this point I have the car fully driving and have literally just had it dyno tuned yesterday. It's now at the point where I can drive it daily, which is what I'm going to be doing starting Thursday this week. There is still a HEAP of little things to finish off but now that I'm daily driving it, I may as well put the specs up here. This is the one people refer to as the EZ30R - the later model one with 3 exhaust ports per head, the plastic intake manifold, and AVCS. Drive-by-wire throttlebody deleted and replaced with traditional cable style from an AU Falcon. 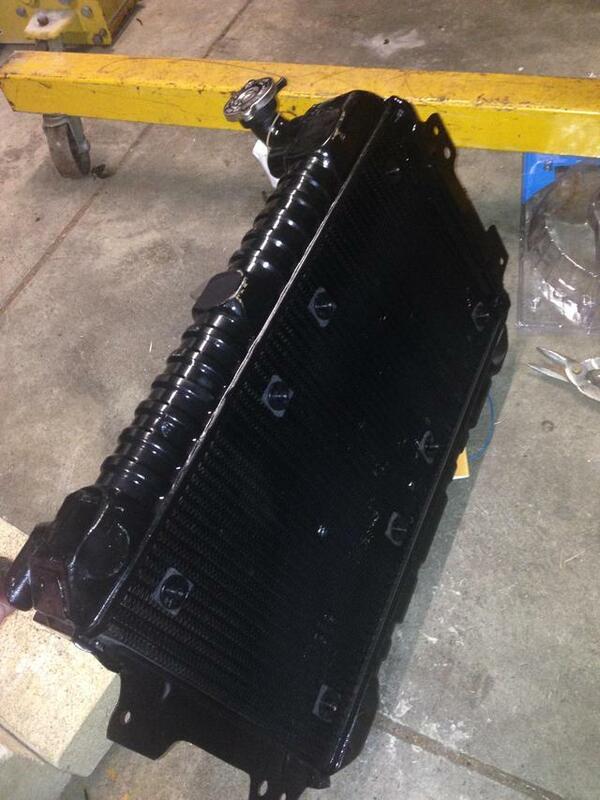 Originally a brand new Series1 Mazda RX-7 radiator. Brass tanks, copper core (triple core), fairly heavily modified for clearance, filler neck location, inlet/outlet pipe locations and numbers of.Two 10" slimline Davies Craig thermo fans between the radiator and motor. Vi-pec V88 standalone unit. 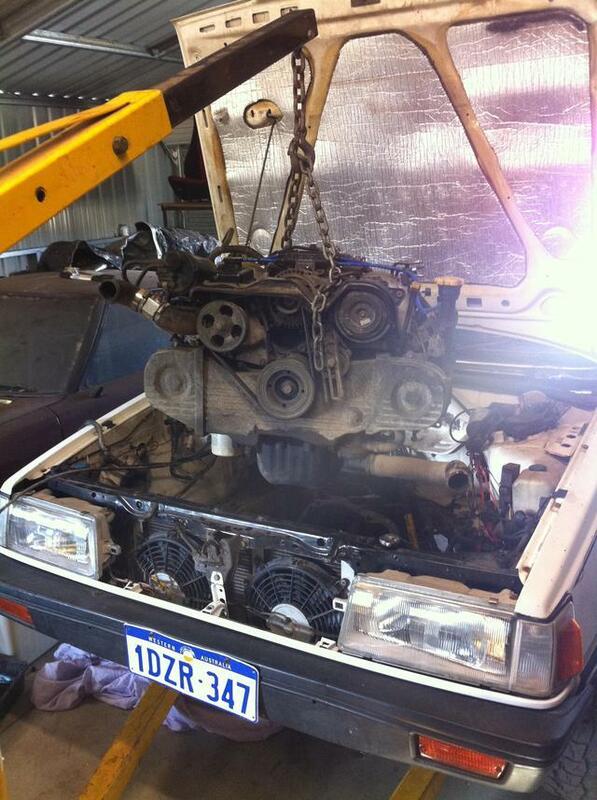 (Only the engine loom for the EZ30 remains from the donor vehicle - no original ECU loom at all). Dyno tune by Sean at ASG - 181hp at the wheels. Raptor performance full replacement EZ30 headers, stainless. Windscreen surround rust repairs and re-sealed windscreen. Otherwise generally an average condition/looking L series wagon, all the usual shabby bits and dints here and there. 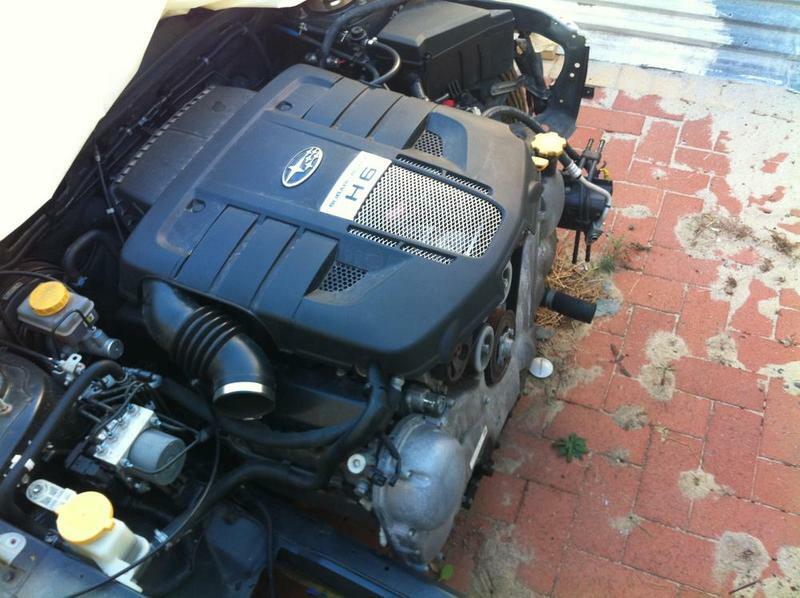 SF Forester 5speed dual range (has 1.4:1 low range), 4.111 final drive ratio. DCCD centre diff (from some kind of STI) fitted. "DCCD-Pro" manual controller (not yet connected). Plan to upgrade this to a stronger SG box later, add front LSD and SF low range etc. Shifter linkage and mount are cut about 1" shorter to fit the L series. Dual range selector retro-fitted inside the car. The only thing they used from my existing tailshaft was the centre bearing assembly which they rekoned was as-new. As pictured, it just has a crappy set of 16s with crappy road tyres on it at the moment. There is a set of 4 x 15" Audi wheels, with brand new Kumho KL71 mud terrain tyres sitting in the shed ready to go on, but I need to cut the guards nicely and get some flares before I can fit these. Full Liberty engine crossmember with Liberty wishbone control arms (no L series radius rods etc). Whiteline anti-lift mount brackets used for Control arm mounts. Custom 1-piece lift block / adaptors to act as lift blocks where the radius rods used to mount, and provide an "adaptor" to allow the control arms to mount. Note that this means the front end wheel-track is Liberty spec, so slightly wider than L series. I have put bolt-on wheel spacers on the rear end to match the track. Standard SF forester steering rack (ultra low kms, apparently ~30,000kms somehow). Power steering lines are the EZ30 ones, they plug straight in to the rack. 3" Strut tops (not the best, they came with the car, I'd like to get them re-done some time). 2" Engine crossmember lift blocks with offset mounting holes to allow the slightly wider Liberty engine crossmember to bolt in. No tailshaft centre bearing spacers (I had a fair bit of tailshaft vibration before removing them, all good now). I do have a clutch-pack diff from an old RX I could chuck in but I'm working on an idea for an air-locker setup so the open can stay in for the time being. Front: SF forester shafts. Boots look like they might let go soon, have a pair of brand new "Chinese" E-bay shafts I'll put in sometime soon and see how they go. Rear: Brand new L series "Chinese" E-bay shafts. Quality seems great. Front seats: Black leather from 2007 Liberty, both with full electric movement. (custom mounted). Centre console: SF forester console. Not finished fitting up, just kindof sitting there at the moment. Double Din Android head unit (GPS Satnav, media player, reverse camera etc etc), not wired in yet. Brand new Momo steering wheel, not fitted yet. Brand new carpet and sound deadening underlay. Suba-extreme steel full rear bumper replacement, with swingout jerry can and spare wheel holder. After picking it up yesterday, I can say that it drives pretty damn nicely. Considering there is no kind of boost involved anyway, this thing really moves. Can't wait to get it offroad. The exhaust is ridiculously loud with the muffler open when flogging the car, I will need to get two "hotdog" resonators fitted asap. From the outside there is absolutely no hint as to what bits the car is running. It just looks like any old 2" lifted L series with 5stud conversion. Really long list of stuff still to do - tidy up wiring, fit rear seats, sort out airconditioning, fit roofracks, fit stereo, fit new steering wheel, fit inner wheel well plastics, custom make a bash plate, fit towbar etc etc etc. I'll put a bunch of placeholder posts in next so I'll have room to write up all the details of the build, with all the photos. 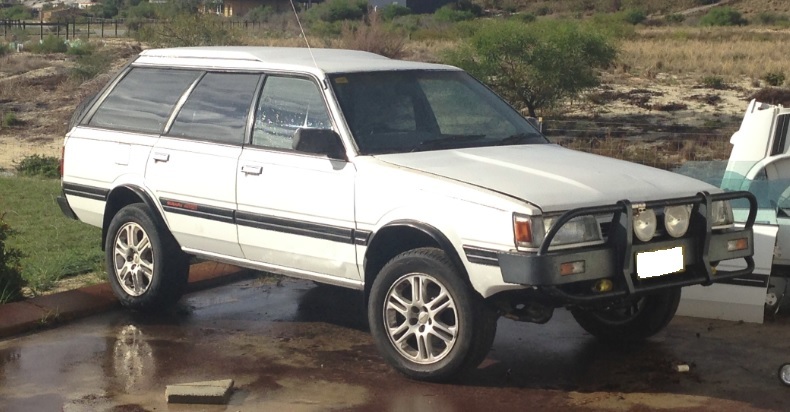 Many of you would remember the original Monster Wagon – 6” body lift, EJ20turbo, RWD gearbox intended to mate to a Nissan divorced transfer case (transfer case never actually happened). It was a bit crazy, although I did prove the concept. It drove really well. I just never ended up getting the actual transfer case idea happening, and then life got in the way, plus I let the car’s rego lapse. It was just too daunting a task to return it to stock to pass the pits and start all over again. Also the body was starting to get pretty rough, and it was damaged pretty badly in parts from some previous offroad accidents. So I wrecked it, saved most mechanical parts, and sent the body to scrap. Not having an L series, let alone an offroader did not sit with me very well at all. So I thought I will keep an eye out for another one. I decided to set my sights on modification much MUCH lower, basically so I could have an offroader I could actually use, rather one that is perpetually in pieces. I figured I would do a few mods using some of my big pile of spares / aftermarket bits to get it reliable, comfortable, capable offroad, and usable. So I bought it and got it transported to my place on a flatbed. This was around February 2014. When the car arrived, the car battery was completely dead. So I put a good one in and it immediately started up and ran perfectly fine. So I took it for a drive and it still ran completely fine. However the mechanicals were in a really bad way. -	Lots of really worrying clunks coming from everywhere. -	Rear CV joints were clicking really badly. -	Steering was clunking and had random points of heavy resistance. -	Exhaust was leaking really badly. -	Gearstick was the sloppiest I have ever encountered, as if it had no linkage bushes at all. -	Handling was really really bad. -	Brakes were spongy, ineffective and pulled the car badly to one side when using. -	Realised that it only had effectively half a lift kit. The rear end had no lift blocks at all, just the strut top extenders. That would be why the rear CVs are stuffed! -	Found the rest of the lift kit was a really bad backyard job made of bits of box section way too thin, with no anti-crush tubing. -	Liberty EJ22 radiator had been installed, meaning the lower radiator support had been completely chopped out and replaced with a very thin bit of angled steel (almost like flashing from a shed). Two no-name brand thermos fans were installed, on the wrong side of the radiator. -	Realised that I seem to have the only L series wagon in the entire world with no towbar. Overall it felt quite unsafe to drive. However it did run and drive and basically worked. So I used the car a handful of times to cart some things around in the boot. Also tested its offroad abilities a bit going up and down our boggy firebreaks to collect firewood. -	Install my ********* kit to go to 5stud. -	Re-use my original idea from Monsterwagon1 and run a full EJ front crossmember and EJ control arms. -	Use EJ brakes all round. -	Go to an AWD dual range driveline and figure out a few traction aid addons. -	Figure out some kind of different engine for the car, something unique. -	Make sure that the car runs nice and smooth, is reliable, and has all the basic things a car should have (heating, aircon, everything working). You know, like something your wife or girlfriend could ride in or even drive without feeling like they are in Fred Flintstone’s car. I figured the best way to get motivated was to decide on what motor to base it on. I thought, well, as far as I know nobody has successfully done a H6 conversion to an L series. The only one I can think of is something I remember reading about something like 10 years ago where somebody had done it in the USA somewhere, and used one of those old ER27 H6s (the 2.6litre one from a Subaru XT which is basically an EA82 with 33% extra crappiness), or it could have been the 3.3 litre EG33. I seem to remember they had to mount a radiator in the boot or something like that. My wife’s car is a 2005 Liberty 3.0RB with a modern EZ30 H6. It’s a bloody brilliant engine. Smoothest most refined motor I’ve ever experienced, and pulls like a train. -	Wiring. To have any chance of doing the usual “wiring loom cutdown, use factory ECU” I would have to use the older version of the EZ30 found in early Outbacks. 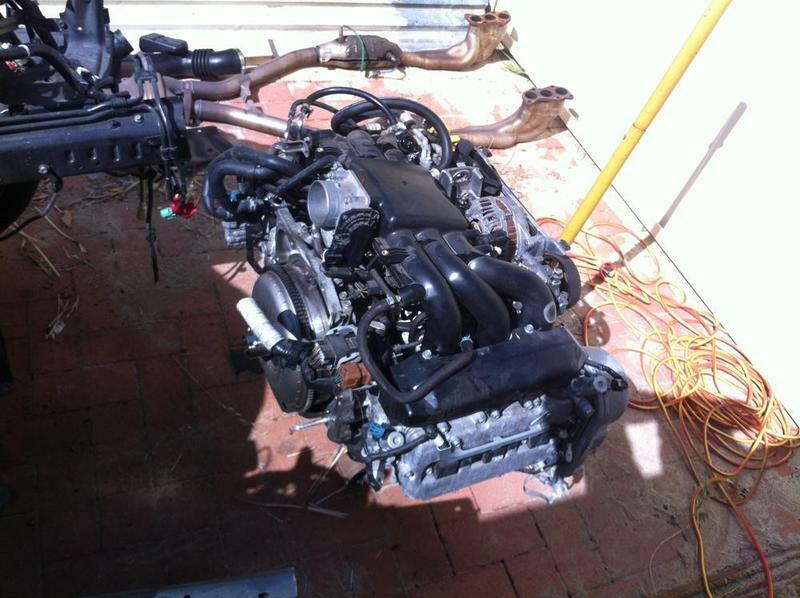 These are the ones with the metal intake manifold and only 1 exhaust port per head. To use the later model EZ30 (often referred to as EZ30R, which has 3 exhaust ports per head and fancy things like AVCS etc), there is no way to cut down and re-use the loom and ECU because it’s based on a CANBUS system, which is too hard to make work without the rest of the car and the original transmission…unless you go full standalone ECU. -	Dimensions. People told me “completely impractical in an L series…you’d have to mount the radiator in the boot”. 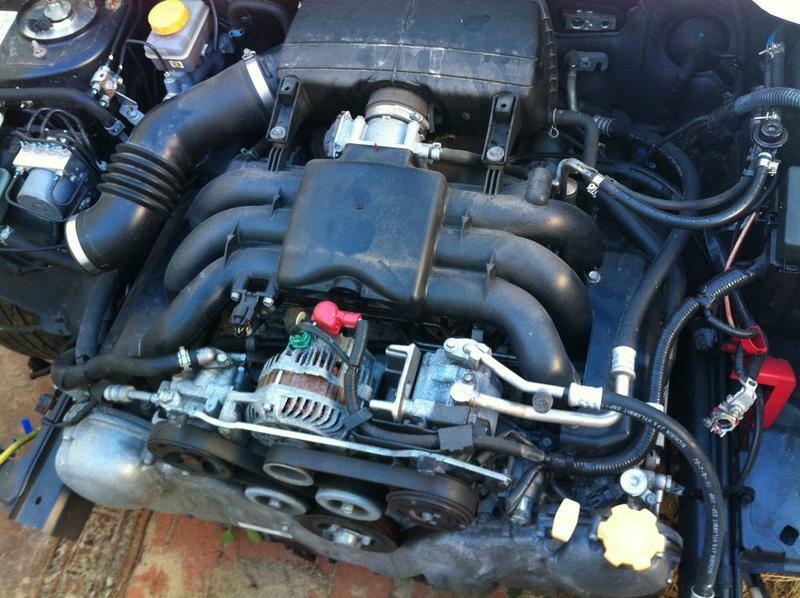 I slapped a tape measure across the 3.0RB’s engine bay, and across the L series engine bay. Looks like it should fit between the rails. Engine is only ~40mm longer at the front than an EJ20turbo so radiator setup will be fun…but I’ll figure that out as I go. -	Weight. EZ30 is ~40kg heavier. That’s not much really. It’s like having a 14yo sit on the bonnet. I’ll be running my Outback struts and springs too so I don’t see this as an issue. So I thought, well, if those are the only hurdles I think I’ll just give it a go anyway. ***Note that the early and late EZ30 motors are technically both called the EZ30D, there is actually no such thing as an EZ30R. It’s just something people made up based on the fact the later model version came in the 3.0R and 3.0RB Outbacks and Liberty’s. I decided what is the point in going to the trouble of getting the thing to physically fit and be cooled properly if I don’t fit the better late model version of the engine? So I researched a bit more into aftermarket ECUs and figured out what was required. Okay, let’s go with the EZ30R. I have done this thing unassisted, in my spare time. I have basically NO spare time – which means pretty much 15 minutes to 1 hour per week if I’m lucky. There have been periods of up to several months with no progress at all. Really it’s a solid couple of weeks work at most, just spread over 2 years. -	Some body panel welding for rust repairs. Credit to a boilermaker I found on Facebook. -	ECU wiring and general wiring advice: (of course) Subarino Dave! I had a look at the local smashed car auction and attended one intending to bid on a smashed Liberty, but it went for WAY more than I was prepared to pay. 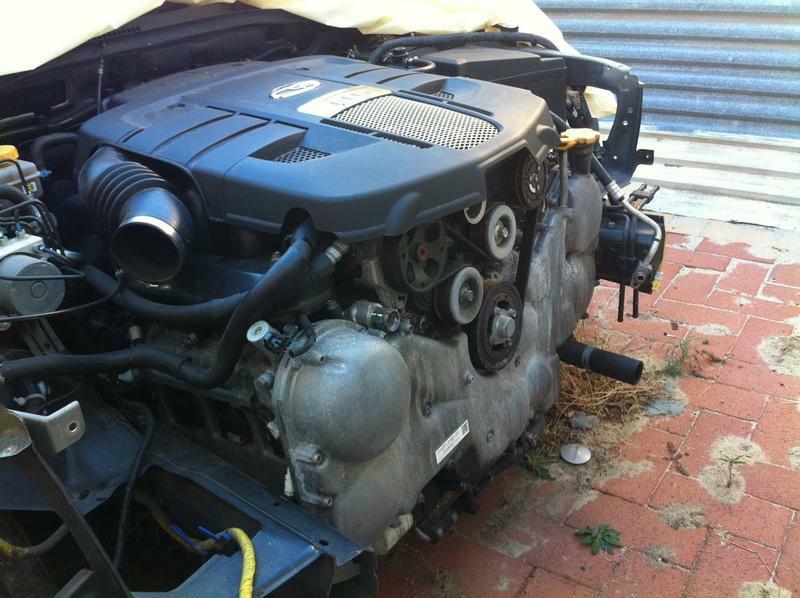 I checked out Gumtree and amazingly there was an engine (by itself) for sale. 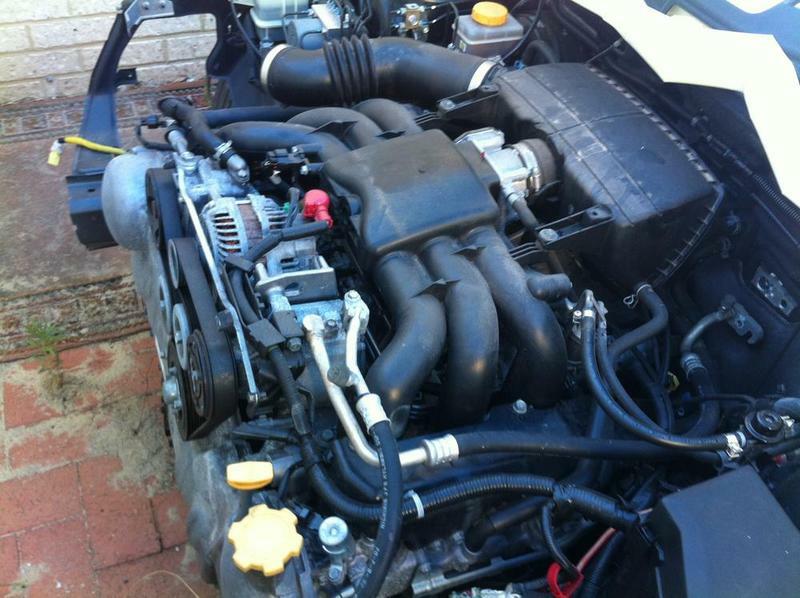 EZ30R, in a 2007 Auto Liberty, ~140,000kms, excellent condition. The guy had purchased a rear-ended Liberty to grab the front panels from to repair his front-ended Liberty. He didn’t need the engine and he rekoned it ran great. I had to take his word on this as I couldn’t run it due to too much of the car being stripped (interior, dash etc was all gutted). Here are some photos of it still in the damaged Liberty, and immediately after removal. Having no front to the car made things a bit easier – I brought my socket set and trolley jack, and then came back later with my hoist to lift it into my trailer. Here it is home, sitting near the ready and waiting L series. Rekon it'll fit? So I guess the first step is to remove the EJ22 currently sitting in the car. Yay, it fits. This is with it just sitting on the EA82 crossmember. About 10mm clearance to the chassis rails at the nearest point on both sides. I pulled it back out again after that, it was just a test fit. On a site note, this car came with quite a bit of rust and a bad bog job all round the seam where the spare wheel well is in the engine bay. Just before sticking the motor in here, you can see I had run a grinder around there to see how bad it was, and doused it in rust converter. More (much more) on that later. So at this point while the engine bay was clear it'd be a good idea to tidy it up alot, see about fixing some rust, and put some paint here and there. Spare wheel well in rust converter white paint. Quite a few bits missing! Pulling out the EA82 front mechanicals. In this photo you can also see my new lower radiator support - a big bit of box section. This bit had already been chopped out by the previous owner (to allow an EJ22 liberty radiator to be fitted) but they used a really thin bit of angle for it. I wanted something a bit more substantial, and also different for my radiator plans. More photos of the engine bay getting more primer, and finally getting white. I got some spray cans mixed up in the original paint code to match the car "Arctic White". During this time I also needed to organise a gearbox of some sort. As time was tight, I didn't have time to organise a custom gearbox (which I'd like to at some point) so went with something I think will do the job well for the moment. SF forester 5 speed. It's AWD, it has a decent low range ratio, and should be fairly cheap. Found someone with a written off SF Forester and got it for free - can't argue with that. Just cost me $80 to get a guy with a flatbed truck to pick it up and deliver it straight to my driveway. Easy as. Organised a new clutch kit to suit the SF gearbox. This was bought from ABR in Osborne Park and it's an Exedy kit, although not quite the same. Apparently they're made in the same factory but don't come with the pink paint. This is a new heavy duty pressure plate, new clutch disc, and new spigot & thrust bearings. I also got the SF flywheel machined. I removed all the Automatic stuff from the EZ30 (torque converter, flex plate etc). At this point I made quite a critical mistake, but more on that later. Mr EZ30, may I have the pleasure of introducing you to Mr SF 5speed, please go easy on him. I organised a DCCD centre from an STI 5speed gearbox. This was a straight swap onto the back of the dual range SF gearbox, quite easy to do. I hear there are some difficulties getting a DCCD centre to fit but if you get one with the whole housing, it's just a straight swapover. The red SF Forester I got the gearbox from randomly came with a Whiteline front strut brace. Here's a photo of starting to prep the Liberty front crossmember, bolting the whiteline brace on. Note - here is yet another mistake, more on that later. Wow that looks great Andrew!! Some awesome gear gone into it and a lot of time/effort I'm sure too!! I bet you're chomping at the bit to get it off the black top!! I don't mind those wheels, but I bet the Audi ones will be mint. I cant wait to see more pics and get a look at MW 2's heart. Lots of time yes, but really it could have been done alot quicker if I had more free time. It's been done basically 15 minutes at a time. The Audi rims don't really look that good but I'm going for functionality over looks really. Who wired up your ecu to the motor? I bet your glad the day has finally come when you can have a licenced semi practical yet ridiculously customised subaru offroader! Congrats on persisting through all the headaches and custom things that others (like me) couldn't be arsed doing. I look forward to driving past your work tomorrow to eyeball it in the flesh! 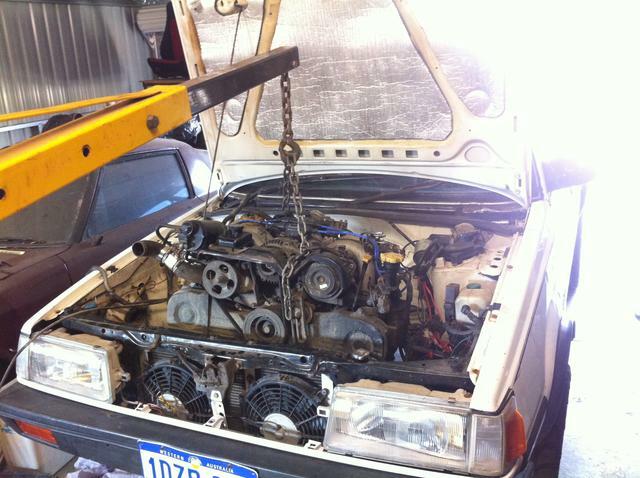 SuBaRiNo wrote: Who wired up your ecu to the motor? As far as I know I was the first to do this way way back with the first Monsterwagon, as part of the huge 6" lift kit. There are photos etc in my other Monsterwagon thread I think. It's just a matter of making the lift blocks where the radius rod normally mounts in a way that presents mount holes in the right place for the liberty control arms to bolt in. I did a pretty terrible job, it was just a proof of concept but it worked great. This time around I was just going 2" body lift, my time was severely limited, and I wanted it done right to avoid re-doing it again later. Found someone local who'd made a similar concept lift block/adaptor setup (but way way nicer than mine!) for 2 other people so got him to make me some too. He also did the engine crossmember blocks with offset holes for me too (last time I slotted the holes in the actual crossmember - offset lift block holes is a better idea). These pieces are still in R&D so I can't say who did them at this stage. Subafury wrote: I look forward to driving past your work tomorrow to eyeball it in the flesh! Holy flying duck balls! Not only do we have a H6 L series on the forum but we've got a blast from the past drop by... I haven't seen Subafury on here for ages! Nice one mate! you'll have to bring it out fishing some time. I took a brief drive in a h6 fox a few weeks back. Very smooth motor, nice and powerful in the sand. 181hp in a L body should be sweet! You are really dedicated to the L series shape! I do like the L series. Decent storage in the wagon area, good aproach and departure angles. If I waste the LCA setup I could very easily shove the driveline package into any other suby I like anyway, standalone ecu makes that simple. Might go a Gen4 Outback maybe one day. Not trying to say you've wasted your time. It's an impressive amount of work. Probably no secret the L series isn't my cup of tea but that's no reason it can't be any others. When I stand back and look objectively at the L they are a fairly plain square box. But after spending so many years with them I love them almost as much as my Brum. I'd love to do it again like this. I've always struggled with the "lift or lower" choice though. It would be an exceptional sleeper on the street slung over some low profiles. But then again how awesome would it be in the sand and mud....... I'd need two of everything. Back to the rust repairs in the spare wheel well. Be prepared for some of the worst welding you've ever seen, but hey, it was functional and did the trick. All holes were covered up with patches of metal and welds. Plenty of grinding and some filling with fibreglass just to get a smoother finish and it came up pretty well. I got behind the dash and made sure it was all covered in rustkill paint too. I then spent some more time finishing the Liberty front crossmember ready to fit to the car with the Liberty wishbone control arms. This is the same as my original idea back when it was 6" lifted except this time I got someone else to supply me with the adaptors to mount the wishbone arms to the L series body. These are still in R&D and I can't put photos of these up at this stage. During the wheel well rust repairs I also fitted up the brake booster (L series booster), Liberty 1" master cylinder, and retro-fitted the SF forester clutch mater cylinder to the firewall. 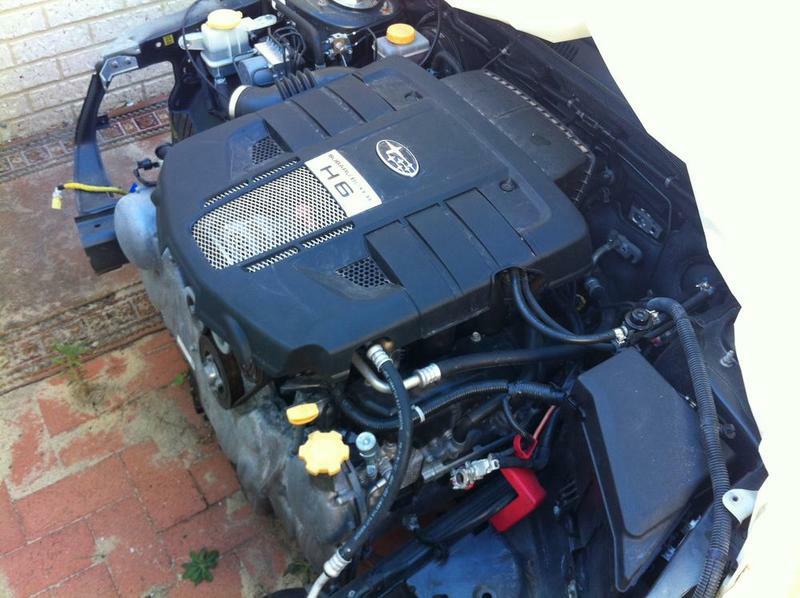 Also during this time I fitted the EZ30 back into the engine bay. Next I had to organise some sort of radiator. I had planned to use the EZ30 stock Liberty radiator but unfortunately upon looking at the clearance, this was not going to work. At the driver's side, the huge "lump" in the EZ30 timing cover protrudes right into where a huge part of the radiator needs to go. So I had to come up with a solution to put in a radiator that is a fair bit smaller. This is a bit of an issue in a setup which is already likely to have cooling issues due to the lack of room for airflow etc. I looked up at one of my shelving units and saw that I had a brand new radiator sitting in a box for one of my other projects. It was a Mazda RX-7 Series 1 radiator. A brand new triple core unit, completely brass. I had a bit of a look and it was exactly the dimensions needed. Sure it's a bit smaller, but I figure that it's triple core, and also if it can cool a 13b-turbo rotary engine, then it should be fine to do an EZ30. Also being fully brass, that means it's customisable. It would need this as the inlet/outlets are totally wrong. - At the top, it needs two (one of each head on the EZ30), and it only had one. - At the bottom, it needs to be on the complete other side of the radiator (passenger side), it was on the driver's side. - The top tank needed a part of it modified to clear the top of the engine bay part. - The filler cap needs to be deleted and a neck installed to relocate it further into the engine bay for clearance. So I went to Natrad in Osborne Park as the guy there is one of the last old-school guys who actually does brass welding. I actually went back there 3 different times to get various modifications done before it was how I needed it. This took a really really long time to sort out. This radiator is different to your usual Subaru one and has tanks across the top and bottom rather than down the sides. It also mounts by inbuilt brackets on the left and right rather than the rubber mounts Subarus have on the top and bottom. Here you can see the modified top pipes. On the top right the tank has been cut and shut to be more flat. A filler neck has been added, and the bottom pipe has been relocated to the passenger side (driver side hole blanked off). Some photos showing clearance (or lack of). Some photos playing around with mounting the radiator and thinking about putting fans on the front side (didn't end up putting them there though). After a lot of playing around with clearances I decided on mounting two thermo fans between the radiator and the engine. This is really the best place for them. This way the fans themselves don't block airflow. This took ages to get right, and the clearance is really really close. I used two new 10" slimline Davies Craig fans. Then I had to organise the radiator hoses. Again, this took a LONG time. Heaps of trial and error. I spent a lot on various silicon pipes, bends, joiners etc. It's two 90 degree silicon bends with a joiner in between. This one I had a bend done on the radiator pipe itself due to clearance issues, this worked well. Bottom hose (it's on the passenger side). This was the ONLY way I could get it to work. It's a 90 degree bend silicon hose, a joiner, a 180 degree silicon bend, a joiner, and a 45 degree silicon bend. In case you were wondering, the hose clamps cost $2.30 each. Time to sort out the custom clutch pedal to work with the Hydraulic master cylinder. I've made two of these before. One by welding a bit of metal on as a bracket, another I bolted on a bit of box section. This time I wanted it to be really strong so I chopped up an actual Liberty clutch pedal to use donor pieces to make a Frankenstein pedal. Took a fair bit of messing around to get the angles correct but it works absolutely perfectly. You need to alert us when you fill in one of the "place holders" - I've only just read the ones from February! That's quite an effort mate. I can't believe you managed the fans between the engine and radiator. Does it run cool enough? And will you end up with AC? Good effort on the engine bay respray too. I can never be bothered! Yeah I completed the first placeholder back in Feb and didn't bother to put a new post in here to show up in people's "new posts". Figured it'd best contain a bit more information. I'd forgotten how long it takes to bash these posts out especially when there are lots of photos that need resizing etc. There are still heaps more posts to make. Annoying that I used up all my initial placeholders so it's now split across a few pages. Maximum of only 8 photos per post! - Bottom radiator support had to be replaced to allow for the triple core thick radiator as it's much thicker and also needs to go down lower. - Bonnet latch needed the guts of it cut out to allow room to squeeze the A/C condenser behind. It also needed the upright brace deleted, and a special extra brace created which is supported by the bullbar. The bonnet latch also needed to be angled up quite a bit, which resulted in the bonnet sitting way too high when closed. So I also had to cut the actual corresponding catch on the bonnet and re-weld it to be a bit shorter. - Headlights needed some of the plastic surrounds chopped off to get enough clearance for the A/C condenser. - Then there's all the other bits not directly related to the engine: Guard trimming to fit the large tyres, firewall mods to fit the hydraulic clutch master cylinder and EJ accelerator cable, dashboard mods to fit a 7" LCD screen head unit. Basically every area of the car has been tweaked to just squeeze in as much as possible. Yes I believe it runs cool enough. However, a person looking at the Vipec readouts might be alarmed. It runs up to temperature fine, thermostat opens fine, but the Vipec stabilises at about 95 degrees. I have it set to put the fans on at 95 degrees and turn them off again at 91. This seems quite high, but I am quite sure that the readout is pretty much exactly 10 degrees too high and not actually correct. In the Vipec settings, you can tell it specifically what brand/model your coolant temp sensor is. It's set to a particular Bosche one at the moment. I have no idea if this actually matches whatever the stock coolant sensor on the EZ30 is, so how can I be sure it's actually reading a correct value? If I change the settings to tell it that it's using a slightly different Bosche sensor, the readings are about 10 degrees cooler, but seem to fluctuate really quickly. The original setting works very well so I've left it on that, but ultimately what I need to do is actually replace the coolant sensor with a specific Bosche part number which actually matches the Vipec's settings. I have bought one of those "Watchdog" temperature monitor setups to run in tandem. This has a temp sensor to measure the actual metal temperature of the engine, independently of coolant temperature. Theoretically the temps should match. I have the sensor bolted onto the thermostat housing. Low and behold, it reads a good 10 degrees cooler on average. Driving along normally it's low 70s, usually about 72. When stationary it goes up to about 85 or so and the fans kick in (as the Vipec tells them to due to the coolant reaching what it thinks is about 95) and come off again at low 80s. I did some pretty harsh boggy sand work near my place on a hot day and the watchdog did get up to 95 or so, but I was really pushing it hard. Overall it works really well and I'm confident there are no cooling issues to worry about. I've driven it for about 3000kms so far and am using it as a daily. The first few weeks were in hot weather. Yes I am almost done getting aircon going. I've got a brand new universal condenser fitted up at the front. This took another huge amount of stuffing around to get it to fit, with more bits of the car shaved off to try and get precious more mm's of clearance. Also have all new piping, new dryer, and have replaced the stock thermostat with a new one which is completely independent of the car's wiring. I have a new thermostat knob and an on/off switch on the dash now. The last part to make this work is to get the two ali fittings off the compressor custom welded to adapt to the standard universal fittings for the new rubber pipes - the original fittings are apparently Korean and don't conform. Just waiting for Vidler to get back from a work trip to sort that out then I can get it gassed up. Just in time for Winter! I hope this doesn't add too much heat to the front end when it's working. I don't really want to add another thermo fan if I can avoid it, but I think I can work enough magic to actually cram one in to the front end, pushing air through to increase airflow when the A/C is on. Re the swaybar, not sure maybe you're right. That photo is not actually it's final fitment, it ended up coming back out again and getting entirely re-done onto a completely different engine crossmember. I will get to that. Thanks re the engine bay painting. It's not that great, just spraycan stuff, and since then it's kindof covered in a layer of basically rusty dust due to copious amounts of welding and grinding for rust repairs. I will get to that. Any new updates to share on this build AndyT? 1) I stopped using the L series as a daily going back at least a year now. It stood up fantastically as a daily and I put a lot of kms on doing this. Very often with the full family of 4 commuting in to work, daycare, kindy, my wife's work, weekend duties etc. But it is pretty thirsty, and I wanted to mod it a bit more. Found a well priced luxury SG Forester and moved into that as a daily. The L series has prime position of 50% of the proper house garage and is always kept in there now, out of the weather. It is still used heavily - literally every weekend, only missing a few, basing around the big sand dunes at the end of my street, and the occasional other trip out further. I've avoided rocky stuff given the lack of traction aides (double open-diffs!) and lack of any bash plates at all. 2) Actually right around the time I got the Forester (literally it was on the way back from checking out the Forester for an inspection) I lost a back wheel in traffic. That wasn't fun. The back left wheel just came off, in the middle of an intersection. The studs on the car just sheered off (not the bolt-on spacer studs - these were still all intact and bolted to the wheel). Wheel went rolling off into a carpark and luckily hit a tree and stopped. I managed to get the car up onto the nature strip by basically doing a massive burnout on the brake disc with sparks flying everywhere with the little bit of momentum I still had. Got it home on a flatbed, and had it back driving within about 45 minutes. I grabbed some spare studs, put them in, re-assembled without the spacer. Before I actually drove it again, I put 10 brand new studs in, and now permanently run no spacers at the back. The rear track is just a bit more narrow than the front. It would have been my fault ultimately. I would have done the nuts that hold the spacers to the car up way too tight, I should have torqued them properly. They were on there for many years with many kms before this happened with zero warning. It's been absolutely fine since, without the spacers. 3) Recently (as in 2 days ago) I finally got around to sorting out the major positive camber issue at the front end its had ever since putting it together. I swapped out the liberty lower control arms for STI GD alloy LCAs, and the matching longer front driveshafts. It has decent negative camber at the front now, looks really tough, but the main advantage is that the handling is MASSIVELY better! 4) I think the poor SF gearbox is on the way out, it whines a bit now when under pretty much any load. Starting to get a little hesitant to go into the middle of these really boggy dunes near my place in case I get stranded there with the kids! I do have a good SG box sitting here ready to go, but kindof want to trick that out with 4.444 ratio change, front LSD and SF low range before I put it in, and swap my DCCD onto it. I want to combine that with a 4.444 R180 rear diff swap at the same time....so I can do an air locker. 5) I want to re-build the front-end setup soon, in regards to radiator and general mounting of stuff. Want to put a much larger radiator in, and mount it much further forwards so I can fit bigger fans. The cooling has been "okay" however it can't really sustain continued driving at low speed under load....boggy sand along a beach etc for too long. Just gets heat-soak. I plan to build some kind of a steel subframe that will do a bunch of stuff - support radiator, support the bonnet catch, mount the bullbar on it, mount a winch on it, bolt bash plates to it, mount recovery hooks to it. 6) I recently created and filed a proper official will....so I guess it's time to supercharge the EZ30R L series. Light speed is too slow, so I may as well prepare for ludicrous speed. While re-doing the front-end (above), I may as well chop out the section of the engine bay that is a bit in the way of where the SC needs to go and get that all mounted up. Then I pretty much just need to fit 6 larger injectors and go get another tune. Super charge it? You’re nuts! Best get that SG box sorted before the other one goes bang! I’m keen to see what sort of radiator setup you end up with. I’ve had that same problem with my EJ22 on sand and extended climbs (you’ll have to cruise over and I’ll show you a few real hill climbs ). So far the pulsar N13 or 14 rad (can’t remember which one, but it’s the one with the filler neck off at a rearward angle in the same location as the stock L series filler neck), is holding up well, including loaded in sand, but that wasn’t very soft and it wasn’t overly hot at that time of year for a change. I guess it's time to supercharge the EZ30R L series. Thought I'd post up a few notes. In the last update I totally forgot to mention about almost losing the entire car in a fire. Towards the end of 2017 I was happy to have the car on display at the very first Subifest and won the award for "best offroad vehicle". The very next weekend, we had a house fire at home and the L series nearly went up in smoke. We came home about 7pm and there was thick black smoke coming out the garage. Basically our solar inverter had caught on fire, and this was right next to the L series. It got a bit melted (tail light, some trim) and luckily the jerry can with ~8L of fuel didn't ignite. It was pretty much seconds away from being incinerated but I managed to get the flames down in the few minutes before the fire brigade got there. That was a while back down, it still works fine, but has a permanent smoke smell inside (the windows were down), and the paint and entire driveline has this terrible black layer of soot kindof seeped into it. I've still been offroading it very regularly, and it went along to Subifest 2018 too. We got the house fixed up but the L series wasn't covered. We're still in some legal back and forward and there might be a small pay-out coming to help with at least some paint correction. I've been watching plenty of YouTube videos on the Raptor Bedliner product. Used in utes to line the bed with. It's a hard wearing coating with quite a rough textured finish. You can get a tint-able version and I'm considering spraying the entire car in it for something different. a) Radiator: I am trying to fit a very large triple-core Aluminium E-bay jobbie. It is to suit a GD WRX. It's very big, and very thick. I have had to "delete" quite alot of the front of the car - basically the entire part in between the headlights, there the bonnet latch normally goes, all the way down to the lower radiator support section which is also totally gone now. I have mounted two Davies Craig fans to the back side of the radiator and got a pretty good idea of where it will go now. The aim here is (unlike before where I heavily customised a radiator to fit the car), I will customise the car so I can fit a standard "off the shelf" radiator. I like that idea better so I can renew the radiator more easily in future. It will also double as an upgrade as the previous setup did work...but got hot on the beach, needs improving. I am still sorting out replacing the bits of the car that are missing and sorting out actual mounts for the radiator. I want to use the standardard two rubber mounts at the bottom and brackets at the top just like a normal EJ car. The EZ30 of course has two pipes at top (one per head) and I have worked out a combination of silicon tubes, joiners, and a T Piece to get it to one 38mm pipe to suit the radiator now. b) Bonnet latch: I have replaced the part of the car I deleted with one single long piece of galvanised box section I have run from one side of the engine bay (tucked in behind the headlights) to the other. In the middle of that...well almost the middle....I have bolted an SG Forester bonnet latch. I chose that because I had one from a wreck, and because it's a lot thinner than the L series latch. I've run the matching cable and plastic release lever through to the interior and mounted that. I've also mounted the SG jam to the bonnet in place of the L series one. This is pretty tricky as it's offset to the left, and a good 4" further "down" the bonnet than before. I've utilised the original bolt holes and while I have done some welding for this, the up/down force doesn't rely on any weld, it should be just as solid if not more solid than the original latch setup. This still requires some adjusting but I have it at the point now where I can open and close the bonnet. d) Winch mount: I have welded a piece of box section across in front of the radiator, directly to my two chassis rails (above). I've also done another one in front of that, but with two pieces dropping back in a kindof triangle shape to allow clearance for the bullbar uprights. This has created a rectangular "platform" directly in front of the radiator for my massive new 12,000pound winch to sit on and bolt to. This also is exactly at the right position to sit "inside" the bullbar. The bullbar I have chopped out a bit from underneath (which you can't see) for the bottom of the winch to poke through as the winch is too big to completely side inside the bullbar. There is just enough room behind it for the radiator to sit, taking into account the A/C condenser which I'll also mount there. 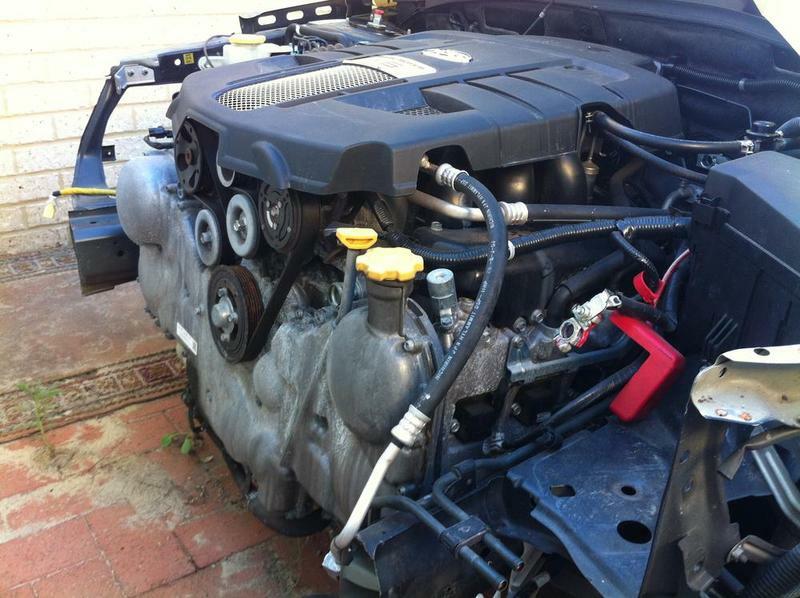 e) Supercharger: I have mounted the big bracket to the engine, and explorer "clearancing" for the actual supercharger. It's designed to fit into a Liberty without any mods. Unfortunately the L series of course has almost no room. Plus I have body lift, so the engine sits low. Basically I've cut a massive gaping hole out behind the driver side headlight. I will need to mount the supercharger properly to the motor then look at "rebuilding" this part of the engine bay around it. It just will fill up the wheel guard a bit more on the outside of the car, but it's miles away from the wheel so should be no problem. f) Recovery hooks: This is a real simple one. I have a couple of proper big dirty recovery hooks I bought way back when I first got an L series but I've never had anything substantial to bolt them to. I intend to bolt them directly to the two big chassis rails I've created. They'll be accessible on both sides from just below the bullbar. g) Bash plate: Once I've finished the radiator mount I'll put some extra bits of box running back under the car. I haven't "designed" this in my head yet but I'm thinking of mounting them to where the swaybar used to mount on both sides of the engine crossmember, and a couple of others further in the middle going right back to the middle of the crossmember where you jack from. Then I'll just get some aluminium sheeting to fill it in. I think I will have to go in between the headers and leave them exposed. I'll loose too much clearance if I go around them. Not sure exactly yet, like I say, I haven't totally figured this one out yet. Right now my next step is to mount the winch to the platform - I just finished welding the platform yesterday and plopped the winch ontop of it. Then I'll mount the bullbar over and around it. Then I'll do the radiator mounts and get it filled up and run to temperature. I will then stop for a little bit - basically I need to do that much to get it driving again. This is becoming an issue as my two girls need me to get it driving so we can go into the dunes again! The rest I can do without making it un-driveable for too long at a time so I will progress those when I can. Then maybe do the Raptor re-spray in time for Subifest 2019!